I must admit, I am not a pork lover by nature. I spent over a decade as a vegetarian and I am still trying to learn to like pork again. My pocketbook appreciates my attempt however! Our family loves chicken and beef so finding a pork recipe that pleases the 4 of us is a big task. Ella partially endorsed this recipe and Theo, Chris and I were very, very pleased with it. In fact, we ate it two nights in a row because I was trying to perfect the recipe for this blog. Cooking Light is one my favorite magazines and one of the October recipes caught my cooking eye. Chris and I approached it together. We added a sauce in addition to the braising liquid for a little step up. The original recipe left the stranded browned bits in the pan – a household sin here! It also called for a cook time well past the new cooking recommendations for pork. After a few minor tweaks, we fell in love with this recipe. I hope you will give this recipe a try. It has a few extra steps but they make all the difference in overcoming the traditional chewy pork thatI grew up on. As a working mom with lots of 5th grade homework, I can vouch for the fact that this IS doable if you get started in the kitchen at 6pm. Preheat oven to 425 degrees. Coat a jelly roll pan with 1 tablespoon of olive oil. Heat a large stainless steel skillet over medium-high heat. Add butter and swirl to coat. Add pork chops to the pan (do this in two batches if your pan is not large enough to fit all four chops and allow space a small gap between the chops.) Brown 3 minutes or until chop release from the pan easily. Flip and brown 3 minutes on the opposite side. Set pan aside, reserving the browned bits in the pan. Transfer pork to center of jelly roll pan. Surround with apple and onion slices. Sprinkle pork mixture with thyme, salt and pepper. 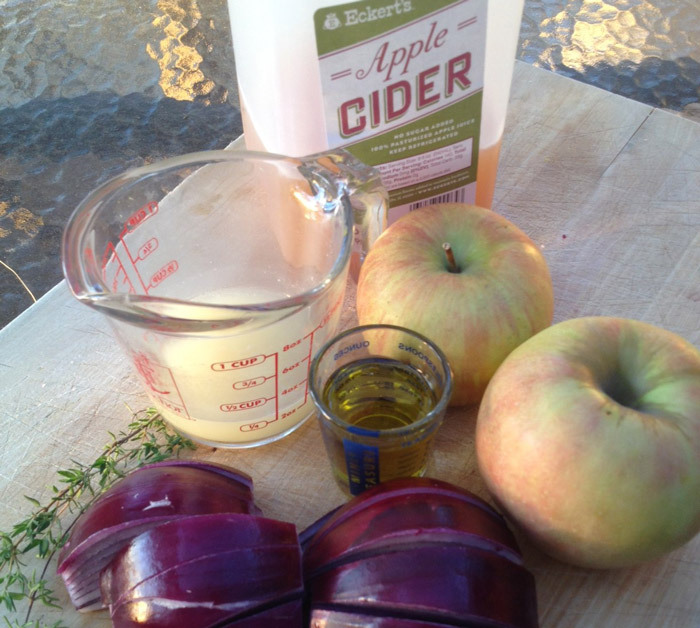 In a small bowl whisk together 1/3 cup stock, 1/3 cup cider and 1 tablespoon of oil. Pour on top of the pork and apple mixture. Roast until pork registers 145 degrees internal temperature, approximately 15 minutes. While pork is baking make the sauce. Reheat reserved skillet over high heat, add cider and water to skillet and stir to break up browned bits. Allow cider/stock mixture to reduce by half. Add butter and whisk to combine. Drizzle sauce over pork before serving.